Just when you thought the Mercedes G500 4x4 Squared couldn't get any more insane. Swedish skier Jon Olsson is well-known for his outlandish winter-prepped cars that typically pack close to 1,000 horsepower. Last year, he unveiled his insane supercharged snow-prepped Lamborghini Huracan with over 800-hp on tap and a ski box on the roof. This was then traded for a customized 800-hp Rolls-Royce Wraith for the summer, which we thought was his craziest creation yet. Now Olsson has picked up his new ride, and it’s a heavily modified Mercedes-Benz G500 4x4 Squared. Olsson calls his creation Lord Hans, named after his brother “who loves exploring the wilderness.” For most people, a stock Mercedes G500 4x4 Squared has more than enough power with over 400 horsepower on tap, but Olsson has doubled that, cranking it up to deliver nearly 800-hp with the help of Dutch tuner Absolute Motors. This is only an estimated power figure for now, though, as Lord Hans hasn’t been tested on a dyno yet and there are still more modifications that need to be made. 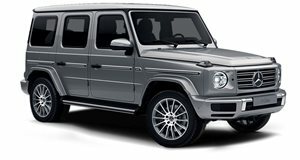 In addition to the reworked engine, the G-Class also features modified suspension, new off-road tires and new lights positioned behind massive protective bars at the front. Like every other car the skier has customized, the exterior is adorned with a distinctive camouflage livery and naked carbon fiber accents. And in case you were wondering, those wires between the bars and the roof aren’t just for show – they help protect the windshield and hold the front bars. It’s also fitted with a custom Brabus carbon fiber snorkel allowing you to drive the G500 in deep water. This is easily Olsson’s most capable car yet, combining the insane power of his previous cars with the off-roading capabilities of the monstrous Mercedes G500 4x4 Squared. Final specifications will be revealed soon, so watch this space.